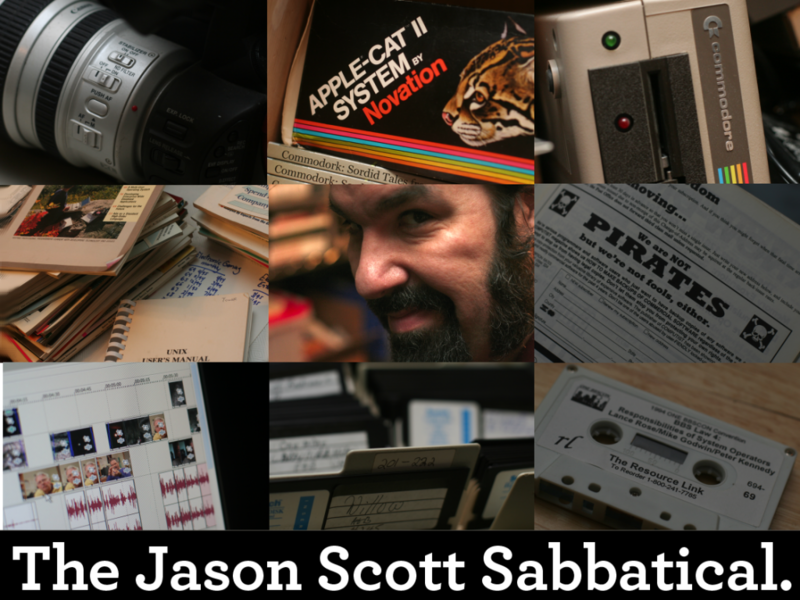 If you’ve been following this weblog for the past few years (it’s getting to be quite a few years, actually) you know I’ve been wrapped up in dozens of projects, ranging from the mid-afternoon inspiration to the decades-on grinding epic. Some people wonder when I sleep. And some people have been surprised to know I had a full-time job at the same time, one that didn’t overlap with any of my projects and history endeavors and travel in the slightest. I’ve always paid my own way to conferences and I’ve put my own time into all the work you’ve seen described on these webpages. So, having been laid off in September, I’ve begun the process of looking around for a career where I’d be able to use my skills in computer history and my love of all things digital in something really positive. And, hopefully, have time to finish as many of these front- and back-burner projects I’ve got in the air. Now, I’d heard of this thing called Kickstarter a while ago, and had been occasionally browsing the thing for projects to invest in or to just marvel at how the idea worked. (I am aware there’s other similar sites – I just thought Kickstarter was pretty slick.) You see a project, you have a pitch up. and then you add a reward set where donating more than just a minimum entitles you to extras and other cool things. I liked this approach. I didn’t think I’d need it anytime soon. But recently, I thought, what if I made a go at it? What if I seriously tried to raise enough funds to live off for a few months, get to work on stuff full time? What if I could get enough donations where I’d be able to have all this stuff I do be the only thing I do? What if I finally finish my documentary on text adventures, clean up textfiles.com’s directories, bulk up archive team’s writings and pamphlets? Conduct research into a bunch of subjects and be able to make my presentations that much better? What if? So I decided to go for it. I’ve created a page on Kickstarter. In it, I am asking 1,000 people to fund me to the tune of $25. There are rewards (with returned items) for larger donations. Some people, if the mood strikes them and their wallet feels too heavy, can donate enough to make me travel to them (within limits) and play my movie and discuss it with them. There’s a bunch of little rewards I put in there. If this works, my mind will officially be blown. As mentioned in the pitch on that page, I would be issuing a report, weekly, to my patrons, showing what I’ve done that week and giving them a 2 day headstart on new materials over everyone else. I’d be, in other words, a subscription to someone devouring digital history full time. That interests some number of folks – I do not know how many. I hope it’s enough to push past this limit. I’ve set the fundraising to 30 days. I figure I can live off unemployment a few more weeks and continue to look for work, while this set of numbers either climbs or doesn’t climb. The time limit plus the ability to see the growth will hopefully encourage people to get involved. I hope you do, I really do. This is a big thing I’m asking. That’s all I can say. If it doesn’t happen, I will still thank everyone who stood up and said they’d be willing. Can you start a separate donation to also fund Halo time? Damn… If only I was rich… I’d donate the full 25,000 dollars to you without a second thought. You’ve educated and (at least as important) entertained me for a few years now. I really appreciate all the effort you’ve put into this website and I’d love to do something in return. Too bad I’m poor. Wish I could help you out, Jason. But I’m in a (financially) bad situation right now. Hope some people with the extra dough to spare will help out here. Hang in there. Come on, rich folks out there! We can’t let textfiles.com die! Nothing happening here is about textfiles.com living or dying. Even if this fundraising is not successful and I move onto “standard” employment, the sites live on – I just don’t have as much time to finish projects. Jason, he just gave you your hook: ”te;Donate, or the dog website gets it!“te; People would be tripping over themselves and others to give you money. First, however, you’ll need to convince them you own Facebook. Hey Jason, this is pretty awesome. I pitched in, and I hope you hit your target, for all kinds of reasons. He’s kind of the anti-you. What’s your PayPal account, so I can send money directly? The fundraiser site does not accept PayPal as a payment method, and I do not have a credit card. I’d like to support as well Jason, but I don’t want a account on Kickstarter, so do you have paypal? You don’t need an account to contribute as a backer, actually!